Below you can view all the homes for sale in the Foxcliff Estates subdivision located in Martinsville Indiana. Listings in Foxcliff Estates are updated daily from data we receive from the Indianapolis multiple listing service. To learn more about any of these homes or to receive custom notifications when a new property is listed for sale in Foxcliff Estates, give us a call at 317-723-5615. Relax, newer roof for peace of mind. MLS#21633225. Jeneene West Realty, LLC. Formal dining room, office, Recreation and bonus rooms, huge great room, updated kitchen, sunroom, fireplace, large garage, yard equip garage, and tons of storage...Perfection! MLS#21631519. Keller Williams Indy Metro S.
Main level has access to large porch for entertaining or go to lower level covered porch for a little more privacy. MLS#21631273. American Dream Real Estate. surrounded & adjacent another 220 acre private estate parcel. lake(s) & river access. MLS#21630124. Vandenbark Real Estate. This fine home overlooks panoramic woods, creek and lake with your own pier leading out to Durham lake.....a must see for the waterman in your family! MLS#21628463. eXp Realty, LLC. NEW Triple Pane Windows with Krypton Gas just installed in 2019! MLS#21628298. RE/MAX Ability Plus. A perfect place to enjoy all of your tomorrows. MLS#21627981. Carpenter, REALTORS®. ft. Beautiful hardwoods, large windows, custom trim, gas fireplace and finished basement with bedroom and full bath. MLS#21626485. New Start Home Realty, LLC. Enjoy a game of pool, pingpong, or hang out in this enormous wide open space. Lake access! MLS#21625493. Keller Williams Indy Metro S.
Master suite includes his and hers W-I-C. Plus a beautiful deck & huge finished 3-car attached garage. MLS#21623824. CENTURY 21 Scheetz. LIFE STYLE COMMUNITY features tennis, pool & clubhouse! MLS#21619869. RE/MAX Advanced Realty. Relax and read the paper in your "tree house-esque" sunroom completely surrounded by nature! Absolute must see! ! MLS#21619470. 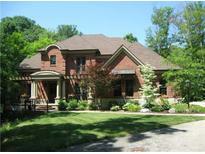 Keller Williams Indy Metro S.
Club house, golf, pool, tennis courts, lakes & more! MLS#21617014. Keller Williams Indy Metro S.
Upgrades abound throughout the home, most notably the kitchen with granite counter tops and all stainless steel appliances, as well as the new waterproof vinyl plank in dinning, kitchen and upstairs bathroom. MLS#21615448. Greentree Real Estate Group. This home will take your breath away, truly one of a kind in this neighborhood. MLS#21615590. Mad Chase Real Estate. A second master is located in the basement with kitchenette and massive bonus room. MLS#21615622. Keller Williams Indy Metro S.
This property won’t last long, schedule your showing today! MLS#21615419. eXp Realty, LLC. ALL NEW exterior paint and NEW asphalt driveway! MLS#21609663. F.C. Tucker Company. Located on the golf course and a quiet low traffic street! MLS#21608284. Keller Williams Indy Metro S.
2 Lots for sale- 86 & 88. MLS#21608489. RE/MAX Results. Finished Basement with Great Room, 2 Bonus Rooms, and Custom Bar. MLS#21605795. O'Brien Team Realty. Roof is a 50 year slate w/ copper outline for everything. MLS#21604229. F.C. Tucker Company. The Foxcliff Community has a lot to offer: pool, tennis courts, clubhouse, lakes and a golf course membership is available. MLS#21601192. Sadler Real Estate. Stunning kitchen has cherry cabinets and stainless steel appliances.Come home, relax and enjoy the natural beauty and wildlife that surround this exquisite home. MLS#21590169. F.C. Tucker Company.